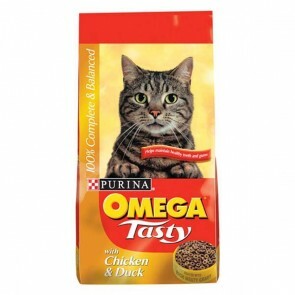 Omega Tasty Cat is a complete and balanced food, which has been designed to provide your cat with the correct balance of nutrients, vitamins and minerals to help keep them fit, active and healthy. The wholesome ingredients have been selected to provide 100% of your cats nutrition and be highly digestible to help ensure that your cat will receive all the important nutrition required for a glossy coat, bright eyes and vitality. 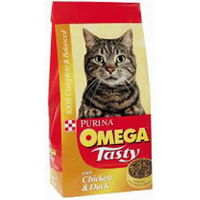 The crunchy texture will help maintain healthy teeth and gums, with added Omega 3 & 6 oils to help maintain your cat's healthy skin and glossy coat. Omega cat: 5 stars out of 5 based on 0 user reviews.